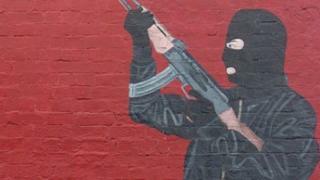 More than £10m has been spent as part of a Stormont programme designed to tackle paramilitarism and organised crime. The Executive Office set it up in the wake of the 2015 Fresh Start agreement. An overall budget of £50m between 2016 and 2021 was put in place - half coming from the UK government; the other half from Stormont. Figures for the first two financial years have been published, with £10.6m allocated to various projects. A large portion of the money - just under £5m - has been spent on getting the Paramilitary Taskforce up and running. In all, 37 funding allocations have been made between 2016-17 and 2017-18. The scheme is run by the Department of Justice on behalf of all Stormont departments. Many other government agencies are also involved. BBC News NI has been told that the allocation of money is - and will continue to be - closely monitored.